HDFS supports a traditional hierarchical file organization. A user or an application can create directories and store files inside these directories. The file system namespace hierarchy is similar to most other existing file systems; one can create and remove files, move a file from one directory to another, or rename a file. HDFS supports user quotas and access permissions. HDFS does not support hard links or soft links. However, the HDFS architecture does not preclude implementing these features. If the replication factor is greater than 3, the placement of the 4th and following replicas are determined randomly while keeping the number of replicas per rack below the upper limit (which is basically (replicas - 1) / racks + 2). To minimize global bandwidth consumption and read latency, HDFS tries to satisfy a read request from a replica that is closest to the reader. If there exists a replica on the same rack as the reader node, then that replica is preferred to satisfy the read request. If HDFS cluster spans multiple data centers, then a replica that is resident in the local data center is preferred over any remote replica. The NameNode keeps an image of the entire file system namespace and file Blockmap in memory. When the NameNode starts up, or a checkpoint is triggered by a configurable threshold, it reads the FsImage and EditLog from disk, applies all the transactions from the EditLog to the in-memory representation of the FsImage, and flushes out this new version into a new FsImage on disk. It can then truncate the old EditLog because its transactions have been applied to the persistent FsImage. This process is called a checkpoint. The purpose of a checkpoint is to make sure that HDFS has a consistent view of the file system metadata by taking a snapshot of the file system metadata and saving it to FsImage. Even though it is efficient to read a FsImage, it is not efficient to make incremental edits directly to a FsImage. Instead of modifying FsImage for each edit, we persist the edits in the Editlog. During the checkpoint the changes from Editlog are applied to the FsImage. A checkpoint can be triggered at a given time interval (dfs.namenode.checkpoint.period) expressed in seconds, or after a given number of filesystem transactions have accumulated (dfs.namenode.checkpoint.txns). If both of these properties are set, the first threshold to be reached triggers a checkpoint. The DataNode stores HDFS data in files in its local file system. The DataNode has no knowledge about HDFS files. It stores each block of HDFS data in a separate file in its local file system. The DataNode does not create all files in the same directory. Instead, it uses a heuristic to determine the optimal number of files per directory and creates subdirectories appropriately. It is not optimal to create all local files in the same directory because the local file system might not be able to efficiently support a huge number of files in a single directory. When a DataNode starts up, it scans through its local file system, generates a list of all HDFS data blocks that correspond to each of these local files, and sends this report to the NameNode. The report is called the Blockreport. The time-out to mark DataNodes dead is conservatively long (over 10 minutes by default) in order to avoid replication storm caused by state flapping of DataNodes. 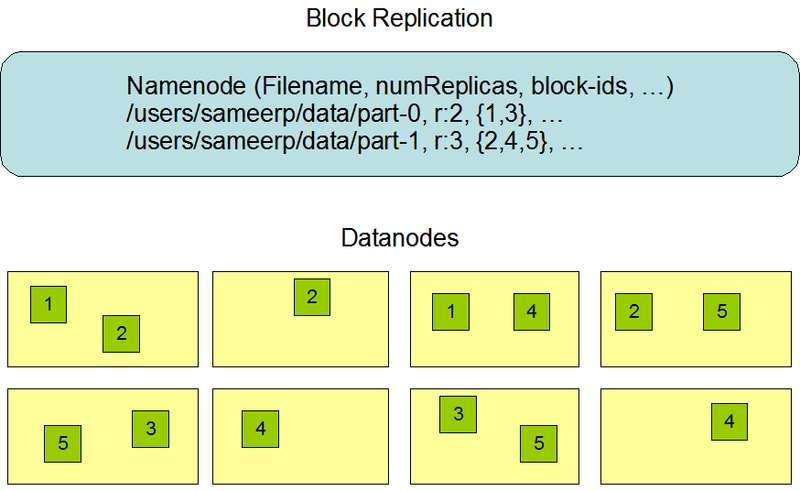 Users can set shorter interval to mark DataNodes as stale and avoid stale nodes on reading and/or writing by configuration for performance sensitive workloads. Another option to increase resilience against failures is to enable High Availability using multiple NameNodes either with a shared storage on NFS or using a distributed edit log (called Journal). The latter is the recommended approach. Snapshots support storing a copy of data at a particular instant of time. One usage of the snapshot feature may be to roll back a corrupted HDFS instance to a previously known good point in time. 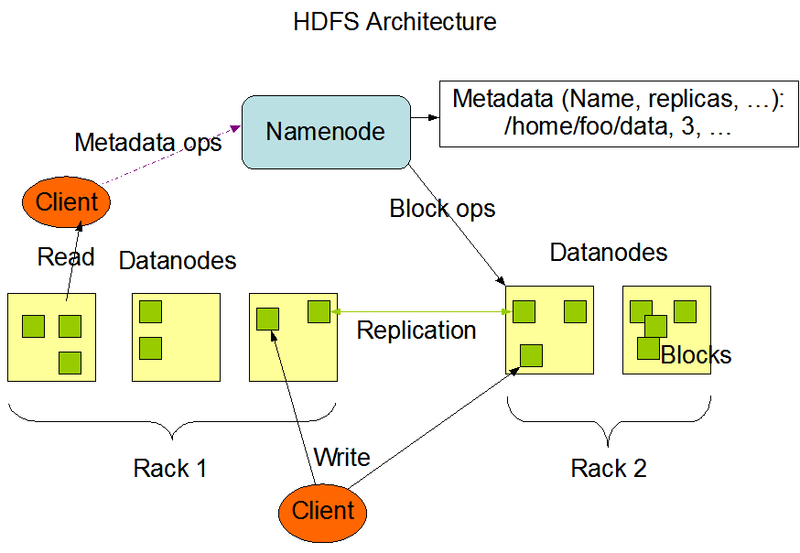 HDFS is designed to support very large files. Applications that are compatible with HDFS are those that deal with large data sets. These applications write their data only once but they read it one or more times and require these reads to be satisfied at streaming speeds. HDFS supports write-once-read-many semantics on files. A typical block size used by HDFS is 128 MB. Thus, an HDFS file is chopped up into 128 MB chunks, and if possible, each chunk will reside on a different DataNode. HDFS can be accessed from applications in many different ways. Natively, HDFS provides a FileSystem Java API for applications to use. A C language wrapper for this Java API and REST API is also available. In addition, an HTTP browser and can also be used to browse the files of an HDFS instance. By using NFS gateway, HDFS can be mounted as part of the client’s local file system. If trash configuration is enabled, files removed by FS Shell is not immediately removed from HDFS. Instead, HDFS moves it to a trash directory (each user has its own trash directory under /user/<username>/.Trash). The file can be restored quickly as long as it remains in trash. Most recent deleted files are moved to the current trash directory (/user/<username>/.Trash/Current), and in a configurable interval, HDFS creates checkpoints (under /user/<username>/.Trash/<date>) for files in current trash directory and deletes old checkpoints when they are expired. See expunge command of FS shell about checkpointing of trash. After the expiry of its life in trash, the NameNode deletes the file from the HDFS namespace. The deletion of a file causes the blocks associated with the file to be freed. Note that there could be an appreciable time delay between the time a file is deleted by a user and the time of the corresponding increase in free space in HDFS. We are going to remove the file test1. The comment below shows that the file has been moved to Trash directory. now we are going to remove the file with skipTrash option, which will not send the file to Trash.It will be completely removed from HDFS. We can see now that the Trash directory contains only file test1. So file test1 goes to Trash and file test2 is deleted permanently.